With summer being a wedding season, making a special card to give is a great way to spread the meaning of love. A golden heart, precious and rare, on a puffy layer of blooming flowers, surrounded by flow of gold and, of course the definition of how love should be, give an elegant style, while the white backgrounds make the color distinct without being overwhelming on the card. 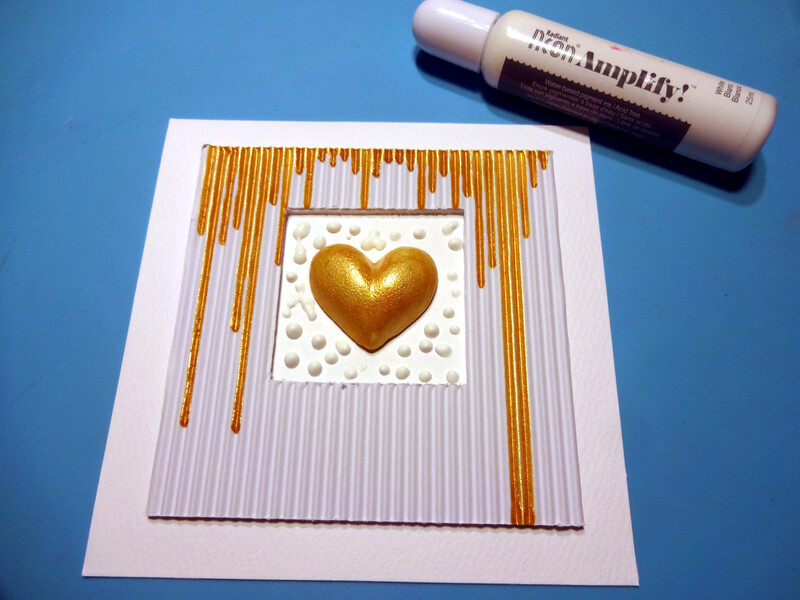 The corrugated paper used, helps to create the flows of gold with the irRESISTible Pico Embellisher Gold color, which also used to paint the plaster heart. The Radiant Neon Amplify! White color, filled the gaps around the heart and the paper flowers and gave cloudy like result and more dimension on the card. Radiant Neon Amplify! will expand when heated adding volume and cover gaps among flowers.